For those of you who haven’t followed this story (and we get lost ourselves on occasions), here’s the story of NFL rotation in California told short: St. Louis Rams are moving to Los Angeles (Inglewood), while San Diego Chargers have a chance to join them if they decide to relocate by 2017. Since early 2015 there were already four concepts of a new stadium commissioned. Two of them in Los Angeles (Carson) and two in San Diego (Mission Valley, where the current Qualcomm Stadium stands). Commissioned by San Diego Chargers, this concept of a new NFL stadium envisions locating this large building in downtown, near the baseball Petco Park. It would occupy vast and underused parking sites currently occupying two blocks. It’s not the first time a proposal of a downtown stadium appears in San Diego, though none of the previous ones came to fruition. Full name of the complex is the Sand Diego Stadium and Convention Center, because these two uses are to be conjoined, in a way even mixed. Structurally they would be separate (convention center in the west and stadium – east), able to hold events independently without disruptions to one-another. But at the same time the buildings could aid each other. As an example, the west end of the stadium is open towards the convention center’s roof, which would comprise a semi-public plaza with viewing deck. Also, with the stadium’s retractable roof, it could be used as exposition space and convention halls might serve as secondary venues. The stadium seating would have permanent roof throughout the year and the retractable part could make it a dome. 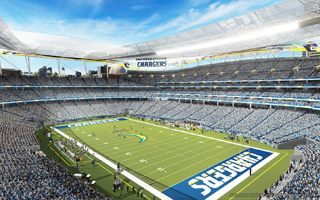 Western open end, from where fans may spill from the stadium onto the viewing deck, might be used for temporary expansion, should San Diego hold the Super Bowl or other large events. This impressive concept by Manica Architecture has one major challenge: price tag. It’s expected to be worth some $1.8 billion (€1.6bn), making it one of the most expensive stadiums every considered. Chargers already announced they would put forward $350 million and secure further $300 million in loan from the NFL. This still leaves $1.15 billion to be covered by, most likely, taxpayers. To make the project viable, Chargers are today launching petition signing campaign. If they collect 67,000 signatures by June 8, they could put a new legislation on vote on Nov 8. The legislation would raise taxes on hotels and tourism in San Diego effectively by 4%, which should secure the public part of the stadium. Still, even with Chargers fanbase exceeding the required 67,000 by far, many citizens might not be happy about footing such bill.